The distinctive presentation is part of what makes this one-of-a-kind bouquet a truly stylish gift. The beautiful blend of Asiatic lilies, Hot Pink roses, Black Magic roses, Orange Unique roses and feathery yellow solidago arrive ready to steal their breath away. 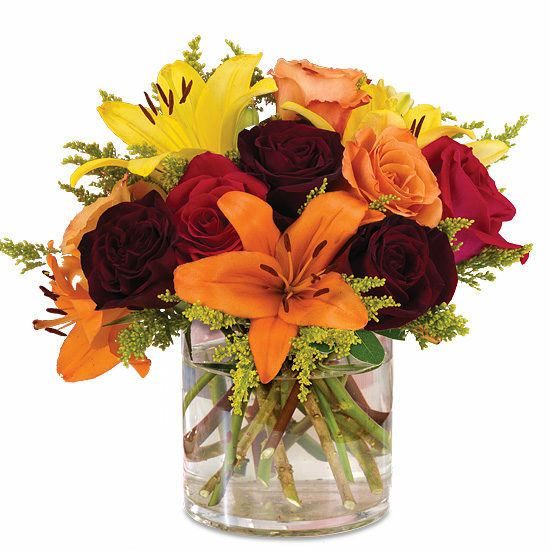 To enhance the bouquet’s inherently warm glow, we showcase it here in our popular clear signature glass vase. Remove all foliage that will fall below the water line. Remove the “guard petal” on each rose – this is the outermost petal left on to protect the bud during shipment. You may also remove any petals that may have slightly bruised during shipping. IMPORTANT! We recommend cutting rose stems underwater for best blooming results. As the lilies open, you may gently pull off the pollen anthers to avoid pollen dust. Be careful not to get lily pollen on your clothing or linens. You may wish to place a protective mat under your bouquet to prevent pollen from falling on your furniture or carpet if you do not remove the anthers. Always add fresh water daily. Trim away spent blossoms as your bouquet ages and rearrange if necessary.